Moana Jackson: 'A Constitution for Aotearoa-New Zealand based on the Treaty of Waitangi' - Wellington on 29 June, Christchurch on 12 July, and Auckland on 21 July 2005. Submissions on the government's August 2003 proposals from Pakeha individuals and groups. Submissions on the government's August 2003 proposals from Tangata Whenua individuals and groups. Links to other sites with foreshore and seabed information. - why are we opposed to them? is this a peace issue? is this a Maori versus non-Maori issue? are there positive ways forward? No raupatu in our time! campaign - read the information - get the badge. The foreshore and seabed debate, Network Waitangi Whangarei. TU MAI Foreshore and Seabed Petition. Te Ope Mana a Tai pamphlets. 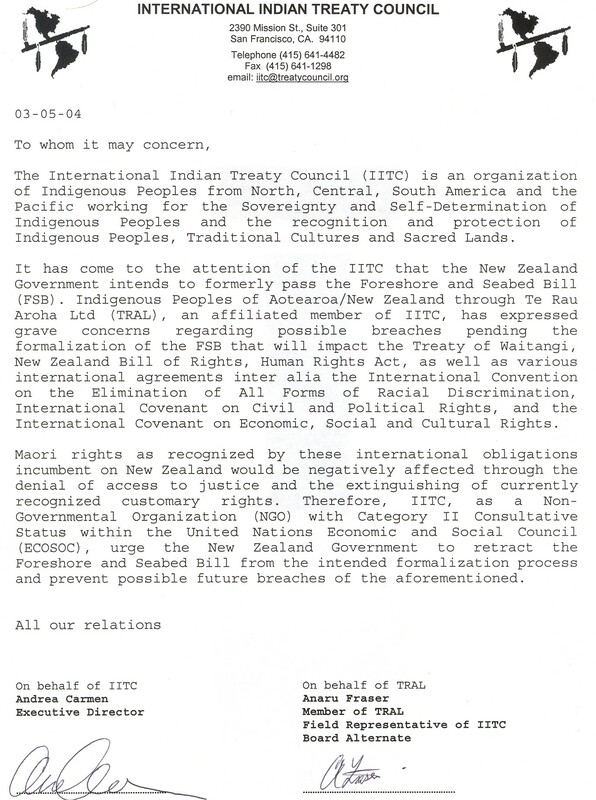 Decoupling the Treaty and the Iwi - Summary Analysis of the Government's Final Foreshore and Seabed Legislative Framework as Released on 7 April 2004, Moana Jackson, 8 April 2004. 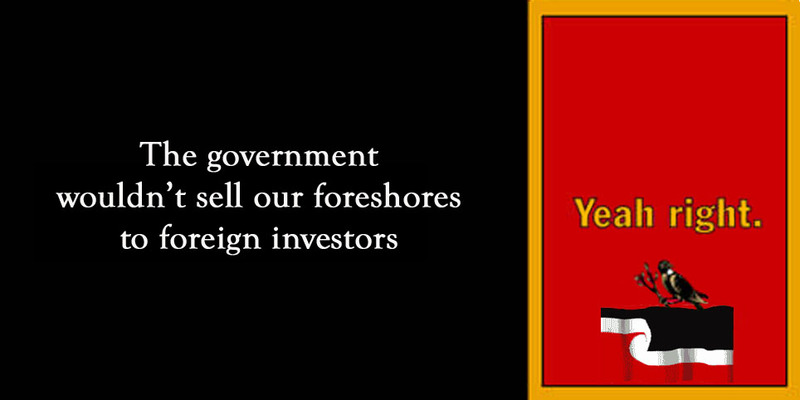 Sell foreshores? Tui advert, Te Taute, 30 March 2004. 'Hands Across the Beach' on 7 February 2004 - the people of Te Hiku o Te Ika in the Far North invite you to join them in a day of celebration and community fun! 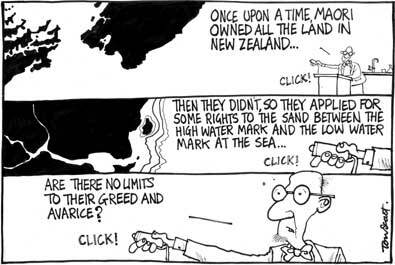 'Let's take a breath, and find out a bit more about Maori customary rights before we jump up and down' - a comment on the foreshore/seabed controversy, David Williams, September 2003. Government building (sand) castles in the air, Takutai Poneke Collective, 4 October 2004 + Photo of the sandcastles! Mana Maori Media is broadcast on National Radio every week day; Marae at 11am on TV1 every Sunday; and Maori Television broadcasts Monday to Thursday 2-30pm to 10pm, Friday 2-30pm to 11pm, and Saturday / Sunday 3pm to 11pm. Hikoi photos: Photos of the hikoi through Kaitaia, Te Runanga o Te Rarawa; Whanganui photos, David James; Hikoi in parliament grounds, Bigshotz Panorama Photography; Panorama Of Hikoi At Parliament, Scoop; Seabed Hikoi Reaches Parliament, Scoop; Hikoi Photo Gallery, Stuff; In pictures: Maori protest march, BBC News; The Day After The Hikoi, Scoop.